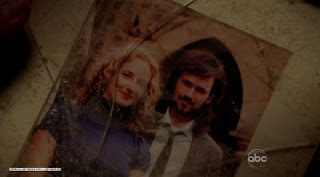 Well, the intention was to start off this post with a measured analysis of the ongoing parallels between Desmond or Daniel, including their relationship to Widmore, or between Theresa and Charlotte, two woman presumably loved by Daniel and injured by time travel. But really, what sticks out most from this episode is Locke creating his own destiny and Charles freakin' Widmore. That Widmore was once a young island-residing Other isn't a shock, per se. The revelation of such wasn't so much a "what the hell?" moment as it was an "ah, I see" moment. With that crucial piece of info, a lot of things start to fall into place. Recall, for example, the loaded conversation last season between Ben and Widmore, and Widmore's use of the dismissive "boy" in reference to Ben, and consider their ongoing struggle over the island. From what we see in this episode, it becomes more than likely that at one point, Widmore was either in line for leadership of the Others, or believed himself to be (or that, chain of command and tradition be damned, he deserved leadership). It's clear in his dialogue to Richard before Locke's arrival that he is arrogant, and believes he has a strong(er) connection to the island. So it becomes entirely reasonable to surmise that at some point, Ben, an off-island outsider as far as Widmore is concerned, comes along and somehow usurps Widmore's leadership (either real or perceived), perhaps even going so far as to somehow force Widmore to turn the Frozen Donkey Wheel, just as Locke's ascension led to Ben doing the same. Once turned, Widmore finds himself expelled from the island and the island adrift in time and space, so Widmore turns his efforts to finding it once again. The other most intriguing event in this episode was Locke planting the seeds of his own destiny. It seems that what drew Richard to test and watch over young Locke was Locke himself. Which raises all kinds of interesting questions about Locke's greater destiny. 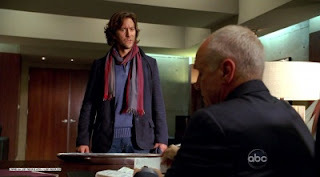 There was an implication in Cabin Fever, in which we see Richard administer the Dali Lama test to young Locke (presumably a component of the leadership selection process Richard mentions here), that Locke failed the test by choosing the knife over (presumably) the Book of Laws...however, Richard continued to check in on Locke, and the implication of failure seemed to have been repudiated by Locke's ascension at the end of last season. However, one has to wonder now if Locke truly is destined to lead the Others; if he did indeed fail the test as a boy, was this 1954 encounter with a time-traveling, Jacob-referencing Locke enough to keep Richard's interest enough to check in with Locke despite that failure? Did Locke truly fail that test as boy? If he did, did Richard have additional reason to continue to shepherd the boy? Is this truly Locke's destiny, or just the one he's creating for himself? Of course, the whole situation has major implications on the ongoing thematic struggle in the show between science and faith, free will and destiny, but frankly, that will have to wait for another time. 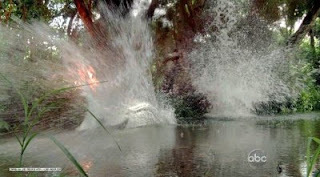 The charged scene between Widmore and Desmond. Both Mrs. Teebore and I cried out loudly at Desmond's stupidity when he walked in. I liked that Widmore gave him the information even though Desmond didn't answer his question, and that Widmore seems genuinely concerned for Penny's safety. So far, in a character that's been painted as being almost universally EVIL, it's the one bit of humanity we've seen. The brief opening flashback featuring Charlie's birth seemed like needless exposition. Consider this: did we need a scene showing us that Penny gave birth? 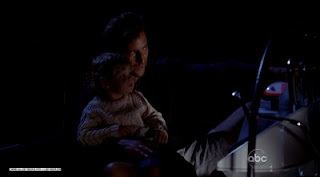 Wouldn't the later scene, with Desmond talking to Charlie about Great Britain, have made it clear enough that Desmond and Penny had a child since being reunited? Was there something else to that opening that will later become obvious, making its inclusion more justified? For what it's worth, someone online pointed out that Desmond is speaking Tagalog, suggesting they're somewhere in the Philippines when little Charlie is born. The landmines at the creek took out a few more Redshirts (though this time, they weren't actually wearing redshirts). The culling continues apace. The Others continue to maintain their "we're the good guys who keep getting attacked first" mentality, with Richard's assertion that the army started it. What are the odds that the Swan station was built over the H-Bomb? 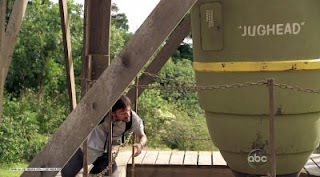 Daniel mentioned using concrete to block it off, and back in season 2 Sayid was investigating the hatch and mentioned "The last time I saw concrete poured over everything like this was Chernobyl." The Others are kind of like murderous hermit crabs: the army comes onto the island, the Others kill them and appropriate their camp, uniforms and equipment. Then Dharma shows up twenty years later, and they kill them and move into their barracks. The Others speaking Latin suggests their society might be quite older than we thought. Or it could just be a cool Other thing. The year Locke and company found themselves in this episode was 1954, fifty years before the Oceanic 815 crash. Juliet's assertion that Richard as always been on the island suggests that his apparent agelessness is somehow confined to him, and not a property of the island that extends to everyone or all the Others, and that his agelessness is not because he travels through time. Of course, Locke's statement that he couldn't shoot a retreating Widmore nee Jones because he's one of his people is really just a cover for the fact that time wouldn't let him, since Widmore didn't die in 1954, shot in the back by John Locke. Who is the female Other Daniel found so familiar? Charlotte's mom? His mom? And who did she think Daniel was at the creek, that "just couldn't stay away?" Just another army guy, or someone specifically? I also assume, since we've known Daniel to be a fairly stand-up guy so far, that his "fleeing to America" probably had something to do with finding a cure for her. Was his whole trip to the island on Widmore's boat to that same end? Who else was looking for Daniel, before Desmond, as mentioned by the clerk? And why didn't Desmond remember the year in which he visited Daniel? When Juliet tells Locke that Richard has "always" been there, how "always" is that? Does Juliet even know how far back Richard goes? 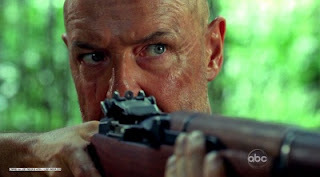 Back to the Oceanic Six in what fearfully looks to be a Kate-centric episode, while Sawyer sees her in the jungle and Locke sees a familiar shaft of light. Finally, I should give credit where credit is due: all screen caps from this post, the last two posts and all forthcoming posts come from the excellent Lost Media. Read online that Widmore may possibly be Faraday's father as well. Also there is some thought that Faraday's Theresa could also be Boone's Nanny Theresa who fell down the stairs and broke her neck, which might explain why she isn't dead due to time-travelling, but does not explain why she seems to be mentally still time jumping.